Gaelic football could be about to experience the biggest ever overhaul in its rules. The GAA’s Standing Committee on the Playing Rules has issued a list of five proposed experimental rule changes. Here, we take a closer look at each rule and tease out whether or not they will be effective. If you examine this year's All-Ireland final, 74pc of the passes made were handpasses (315). Teams are increasingly trying to control possession and the simple fact is that handpasses are easier to execute. This rule would adversely impact teams with a strong running game and suit sides with a higher skillset and with players who are comfortable in possession. Would four or five consecutive handpasses make more sense? This rule will encourage the use of long balls and discourage lateral passes but will place a lot of pressure on the kicker. It will give defending teams an edge because they will know the direction the ball must travel in and lead to greater man-marking. It should lead to more contested ball. What happens if a ball is kicked in a forward direction but is curled to a teammate located behind the points where the sideline kick is taken, or is blown back by the wind? Up to 15 seconds shall be allowed for a free to be taken from a Mark. If the Referee determines that the player who makes the Mark has been injured in the process and unable to take the kick, the Referee shall direct the player’s nearest team mate to take the kick. A score may be made from a free awarded for a Mark. The normal Rules governing free-kicks shall apply (e.g. players being 13m from the ball before it is kicked). It may be necessary for players who take a mark to indicate that they are not playing on, as is the standard practice in rugby (by raising a fist or calling out). You may have a situation where a player stops and then suddenly plays on again. This would give him an advantage over their markers. It will suit players with good ball-winning ability and shooting accuracy. Deploying a player with excellent high fielding skills who can't kick a point could be problematic. The rule might also see players who are poor shooters feigning injury so more accurate teammates can take over the kick. The rule also gives an incentive to defenders to catch the ball instead of break it but this could potentially lead to unnecessary fumbles and the concession of scores. 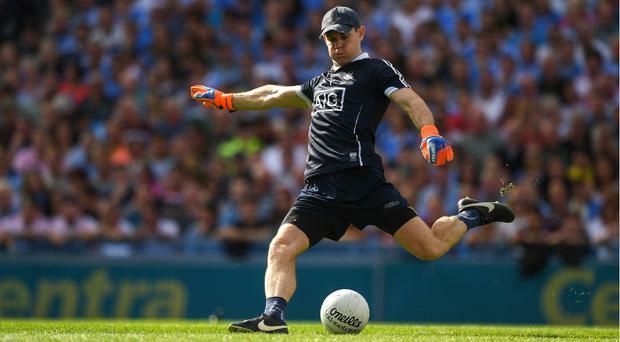 The use of the black card has divided many in gaelic football. The introduction of a sin-bin should have a big impact on reducing cynicism. The fact that a player can receive three yellows before getting a red will raise eyebrows. For this rule to work, referees will have to apply the rules governing red cards strictly. Teams will have to devote more time into preparing for being at a numerical advantage and disadvantage. Will players be allowed to return to the field when the 10 minutes elapses or will they have to wait for the next break in play? This rule is going to be very difficult to police. Linesmen will have to be deployed at both 45m lines to make sure there are no incursions into the middle third. Once the ball is struck by the keeper will the midfield area be flooded? It will give manager's and tacticians a very big role because possession is so key. It takes about two seconds for a ball to clear the 45 metre line, this will give time for half-backs and half-forwards to compete for breaking balls but midfielders will most likely be competing for the ball against their opposite number alone. What two players will managers chose to use in midfield? The tallest? The fastest? It will be intriguing to see how teams adapt to this rule if it is introduced. Goalkeepers will have to kick the ball beyond the 45 but there is no assertion that the ball must carry the 45m line. It might be worth adjusting the rule so that netminders can take the kick-out the kickout from the 20-metre line to ensure that they get the ball over the 45. A mis-hit kickout that dribbles over the 45 could lead to a dangerous ruck between players competing for possession. Another consequence of the rule may be that it delays proceedings. With the use of blanket defences rampant, often 29 of the 30 players on the pitch can be in the one half when there is a score or wide. What happens if we are waiting 20-30 seconds for six backs and forwards to make their way back to their third of the field? That won't make for much of a spectacle. This rule change might not be practical.